You can choose from a range of reliable, hygienic automatic and manual soap dispensers and hand sanitising units in a choice of finishes from stainless steel to easy clean plastic. We also supply the full range of liquid soaps, foam and gels including luxury, standard, Derma (for sensitive skin) and antibacterial. Your Dyno Washroom technician will replenish your soap dispensers on an agreed basis. One less thing for you to remember. Our economical and easy to install automatic soap dispensers detect the presence of hands by a smart sensor and dispense a measured dose of foam or gel soap. Their popularity has escalated in recent years such that you now see them in many washrooms. They help ensure the highest levels of hand hygiene. Our classic soap dispensers in brushed stainless steel or durable ABS plastic are robust and based on a large push button operation to reduce wear and tear. With a one-way valve, they are hygienic too. You can choose from a 1000 ml, 750ml and 500 ml capacity. Nowadays most washrooms include some form of hand sanitising facility in a bid to significantly reduce the risk and spread of salmonella, MRSA, influenza and E. coli. Dyno Washrooms provide a range of compact, sturdy push dispensing hand sanitiser units with the option of alcohol and alcohol free gels. 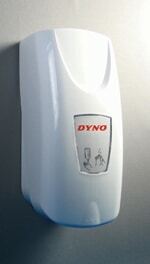 Your Dyno Washroom technician will replenish your hand sanitiser unit on an agreed basis.